Born in a small town called Raghopur in a Maithil Brahmin family, situated in Saharsa district of Bihar. We have spent initial years of our childhood at our village called Satlakha, which falls in Madhubani district of north Bihar. We three sisters are very grateful to our grandmother Smt. Phoolmaya devi and our parents Architect Suresh Jha and our beloved Mother Manju jha for having introduced us to this art form very early in our child-hood. Unlike so many other families of Mithilanchal who have lost touch with their roots, we have grown up with very strong cultural background even after staying in Delhi since last twenty-five years. We remember our mother and grand mother, making Aripana (these drawings – magic circles symbolizing the dwelling of god-are called Aripana, and what in Tibet are known as Mandalas. 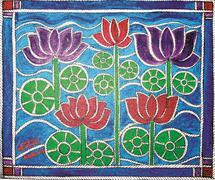 these Mandalas are made by four fingers using thick wet crushed rice paste). Everyday on the floor in front of the Tulsi chaura, main entrance gate and in the pooja room. Whenever we had a festival or any function like wedding ceremony/thread ceremony in our village our grand mother used to leave one of the walls of our pooja rooms to be painted by us. 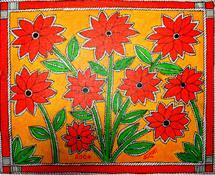 This is how since then Madhubani paintings became part of our existence. We started making Aripana and started painting walls on different festive occasions like Diwali, Durga pooja, Ekadshi, Chaid etc very early at an age of six or seven. I have painted more than hundred Kohbar for almost all of my family members and friends. Subsequent to our childhood initiation our training as architects enabled us to be trifle indulgent with this art form. As a young children we used to just paint mythological figures but architecture (as it is known as mother of all art) gave new dimension to our thought process. In addition to the traditional themes we started painting social themes like ecological balance, changing face of today’s women, images of different cities like Goa, Jaiselmer, Benaras etc. We had been continuously working on this traditional style of painting from our village but the thought of exhibition never came in our mind. Till our first exhibition in 1998 we had more than two hundred paintings to our credit. It was only after continuous advice of our friends and many known contemporary artist of India like Sankho chaudhuri, Arpana Caur, M.R.Ranjan etc. we applied for exhibition in different art galleries of Delhi. Immediately within two months, India international center sponsored us and I had my first exhibition on 16th June 1998.it was a turning point in our life. Suddenly next day we were covered by all the national news papers and television channels like star plus, Doordarshan etc. since then we have never looked back and have exhibited in most of the national galleries of the country. We were among the first ones to get Madhubani paintings exhibited in the leading art galleries, as it was always exhibited in just fairs only. While being very careful in retaining the original art form, in our portrayals we have used diverse mediums like acrylic colors on glass, silk, wood and even glass paint on seashells. Each painting, which we have done, is related to incidences in our own life. In the first two exhibitions we just could not think of selling our works but after lot of initiation from friends and buyers we have started selling our works. People have bought our paintings in different part of the world. Many people mail to us telling that our painting has been inspiring them while working. 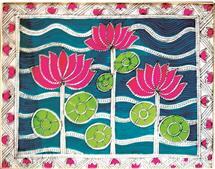 Along with the exhibition we are also engaged in research on different aspects of Madhubani paintings. The objective of our painting exhibitions is to make this art form more popular across the world. Working on this objective we have started taking free workshops in different schools across the country, just to make the children aware about the existence of this folk art from Mithilanchal. If possible we would like to take workshops in all the schools of the world.